Book your amazing wedding band here with Adam Chandler who is well known as a wedding singer in Gloucestershire. Whether it's swing time in Stroud, or you want to get groovy in Gloucester, Adam Chandler has a range of professional wedding bands available across Gloucestershire. Adam Chandler wedding bands – the groove for your Gloucestershire wedding. Adam Chandler's quality musicians have been performing as solo acts, duets, and bands – anything up to a 16 piece ensemble with full light show – for over a decade, in the UK and abroad. So, when you want a professional wedding band to help you and your guests celebrate your big day, there's really only one call you need to make. From the smooth sounds of swing to down and dirty disco favourites, all with a professional approach and friendly musicians, Adam Chandler is the only name you need to know in wedding music and entertainment. 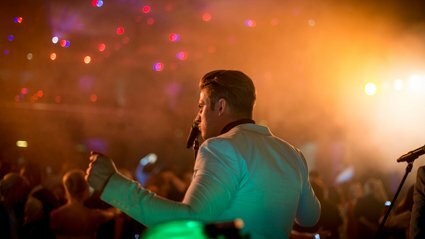 Whether your guest list is a hundred people or ten, whether you're celebrating in a church or your back garden, Adam Chandler can provide the music to suit your mood. The music is what makes a wedding memorable for years afterwards, and the trigger for those beautiful moments of memory that have you smiling and laughing throughout your life together. Weddings are about romance, and romance is about music – so, call Adam Chandler, and take the first step to creating the perfect pairing. From quiet corners to main stage moments, Adam Chandler's wedding bands have got everything covered, and will work with you to make sure your big day is buttoned down exactly as you want it, to the very last detail. Something old – Adam Chandler's swing band. Something new – a disco light show from Adam Chandler wedding music. Something borrowed – the skill and focused attention of Adam Chandler's musicians. Something blue – the sound of Adam Chandler's flagship blues band as they rock your wedding. More Wedding Bands in Gloucestershire! Wedding Bands available around Gloucestershire and beyond!